Lower-Level Laser Therapy (LLLT) has come a long ways over the years. In the past, LLLT required patients to come in multiple times throughout the week to sit under a laser device. Due to how inconvenient this process was, good results were hard to achieve because patients were unable to keep up with their visits. Beyond being inconvenient, the devices at the time were technologically inferior to the in home devices that are offered today. The device that Dr. Darling recommends is an in home device that is very easy to use and is a cost-effective long term solution. It is recommended to wear it approximately 20 minutes, 3 times a day, to achieve significant hair-growth results. 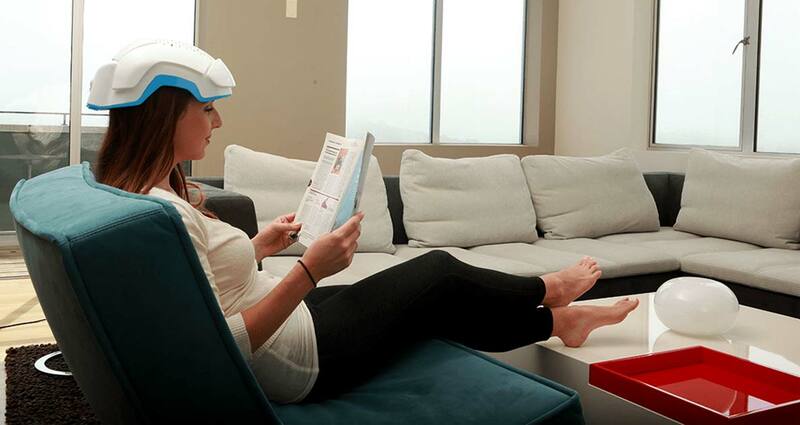 Most daily activities can be performed while wearing the laser cap such as cleaning, driving, working, cooking, watching television, or even just while out on a walk. Dr. Darling offers both wired (with a cable to a portable battery pack) and wireless (battery pack hidden within the device) versions and can discuss with you which device works best for you. Both men and women can find effective results from laser growth therapy with no real side effects. LLLT uses a unique pathway to restore lost hair, it can work well with other therapies, such as minoxidil and/or finasteride, while still being an effective standalone method for combating hair loss. It should be noted, that therapies such as LLLT are intended only for patients dealing with hair thinning or miniaturizing and is not to be used on hair that is completely gone. When hair is completely lost, the laser will not be nearly as effective. In these cases, it is recommended to pursue surgery as the main method for hair restoration. LLLT can be used alongside surgeries such as hair transplants to reverse thin or miniaturized hair and help improve surgical graft growth, both for consistency and speed of results. If someone is contemplating a surgical hair transplant, Dr. Darling advises to consider starting laser therapy before surgery and quickly resuming LLLT after the procedure. There are many LLLT devices on the market today, but most of them have faults that Dr. Darling has come to found compromise patient’s results. For example, comb devices provide the inconvenience of the need to constantly brush them through the scalp, which leads to poor results due to lack of efficiency. Devices also tend to not evenly distribute the laser across the entire scalp in a uniform and sustained manner. Some laser models provide false laser therapy by using light therapy. Light therapy is far less effective than a controlled laser therapy device. Dr. Darling only offers best technology available on the market at a price lower than anything on the retail market. He provides this opportunity at an affordable price in hopes of making it possible for every patient with hair loss to start and maintain laser therapy. After a consultation we can determine whether LLLT is the right choice for you.